Are African Board Games the Key to African Excellence? Are African Board Games a Key to African Excellence? Last week, I wrote about research that shows that African immigrants are more highly educated than native-born Americans. Now I wonder if one reason for their propensity toward success is their cultural and historical use of board games. An article on the Quartz website advocates introducing African board games to classrooms to aid in developing students’ non-cognitive, problem-solving, and social skills. The games remind me a little of chess, which my father and uncles played avidly all their adult lives. But these games from the motherland may be even more strategic. When most of us think about learning, we imagine a teacher and a classroom. In reality most of the things we know, and a great number of the skills we acquire as children and adults, are learned outside the classroom – in conversations with peers, engaging in community service, on the playground. Educators and researchers are increasingly recognizing opportunities for growth presented outside the classroom, and are working to integrate them into classroom learning experiences. Games, in particular, are being seen as learning spaces. This is because they enable players to develop non-cognitive skills, such as patience or discipline, which are important for career and life success. Gameplay also develops a number of cognitive skills, including critical thinking and problem solving. Games have been part of the social fabric of many African societies for hundreds of years. 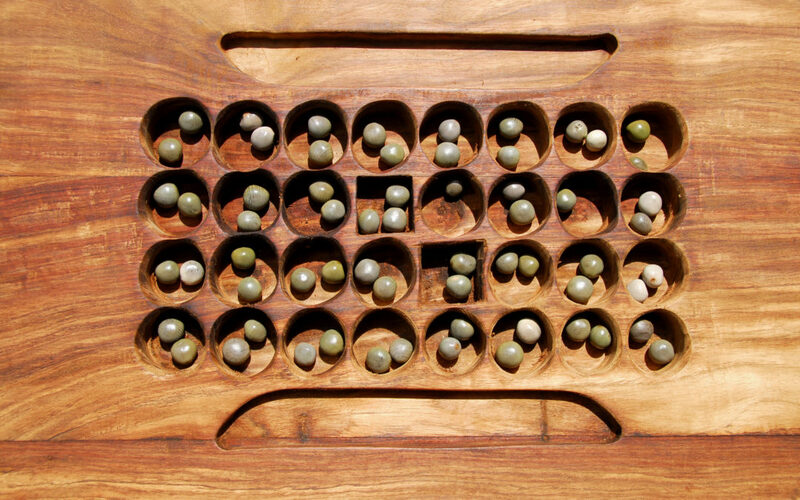 The Morabaraba board game was historically used to share cattle herding strategies in parts of southern Africa (for example, South Africa, Botswana, and Lesotho) and discuss information related to war strategies. And legend has it that Oware was used in 1700s Ghana by Ashanti King Katakyie Opoku Ware I to resolve issues between married couples. Today, board games remain equally popular and culturally significant. Though a growing number of researchers around the world are making the connection between playing and learning, the learning potential of African board games remains severely under-explored. My research – which focuses on mechanics, rules, and context – suggests that the creative use of these games could play an important role in formal education. The board games explored in my research include Oware (Ghana), Bao (Tanzania), Moruba (South Africa), Morabaraba (South Africa), as well as Omweso or Mweso (Uganda). Read more on African board games at Quartz.